What’s better than a monogrammed baby blanket? A monogrammed Minky baby blanket, of course! When you’re a baby, your favorite blankie is already super special, but as a parent, we’re always trying to make things even more special for our tiny tots. What better way to do that than to give them a monogrammed Minky baby blanket. Turn their already-adored tote-along into a perfectly customized baby blanket that they will cherish for a lifetime. Our monogrammed Minky baby blankets are built to last. Minky fabric is extremely durable, making these plush baby blankets fade- and stain-resistant, and able to withstand the havoc which is wreaked upon them by our tiny wonders. You know, the kind where the baby blanket is turned into a napkin or tissue, gets dragged across every dirty surface imaginable, or soaks up that leaky diaper during naptime? Yeah, that kind of havoc. We all know how babies love to rub things between their fingers, most often when they’re trying to fall asleep. Our customized Minky baby blankets are the perfect solution for that too. When you design your own baby blanket, you have the option of adding trim. We have satin binding as well as ruffle trim to satisfy those tiny fingers and make their monogrammed Minky baby blanket that much more irresistible. When you go shopping for baby blankets, you have to get whatever’s available; it’s not possible to monogram baby blankets at the store, which is why we do what we do. Baby blankets are such a special thing to our children, so why not customize a baby blanket for them so they have a reason to truly love it. As they get older, they will know that their monogrammed Minky baby blanket was chosen, designed, and made with love. The process of making a customized Minky baby blanket can be completed in just a few simple steps. 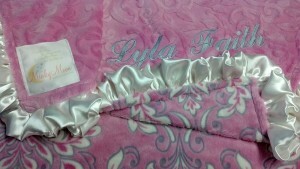 Add your personalized message text (shows on the blanket front), and you’re done! You’ll be able to see the changes you make to your monogrammed Minky baby blanket as you make them. Start customizing your baby blanket now! This entry was posted in Monogrammed Baby Blankets, Monogrammed Blankets on October 23, 2015.